One hundred years after Katherine Lee Bates’ words were put to music in “America the Beautiful,” one man set out on a year- long journey to capture the beauty she wrote about, in photographs. These 365 photographs by The Pikes Peak Guy fully capture the “purple mountain majesties” of this spectacular mountain region over the course of a year, and this project has captured the heart of a community and a nation in a most extraordinary way. The Colorado-based photographer and author known only as “The Pikes Peak Guy” built a devoted and enthusiastic following over the past year through blogging and social media, and sold out the limited edition first release of this fine art coffee table book long before it was released. Today the Pikes Peak Guy Press is pleased to announce that this book will now be available in select stores throughout Southern Colorado. For an entire year, June 1, 2010 to May 31, 2011, a fast-growing base of faithful fans from across the nation who have a special connection to America’s Mountain, or those who just enjoy his creative photographic composition paired with his journal- style entries, anxiously awaited each day for The Pikes Peak Guy’s daily photo of the Peak and posts. In his writings, The Pikes Peak Guy describes his adventures in capturing each day’s special shot and details the challenges and awe- inspiring moments he encountered. The book is an elegant, large-format, hardbound coffee table book. 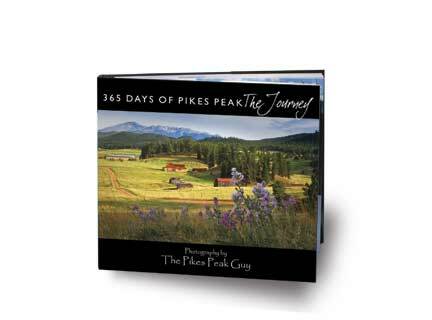 This 224- page photographic journey with 365 magnificent images of America’s Mountain captures all of the drama, beauty, and power of nature that is manifested by Pikes Peak throughout the year. I'm an ordinary guy who set out to create something extraordinary: capturing the beauty of Pikes Peak in photographs every single day for an entire year... and sharing that with the world. 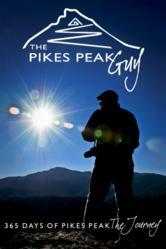 365 Days of Pikes Peak: The Journey has been published by the Pikes Peak Guy Press, Woodland Park, Colorado.